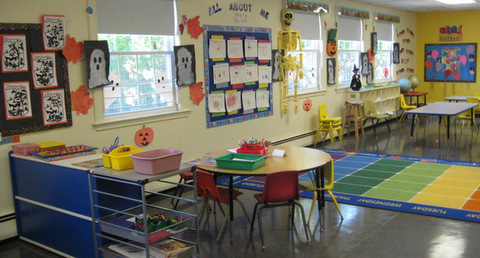 Tower Day School is a Department of Early Education and Care licensed preschool owned by Centre Congregational Church in Lynnfield. We offer preschool programs for 2 years 9 months through 4 year olds and a transition to “K” class for those 4 ½ to 5 years. Tower Day School operates on a school year calendar between the hours of 8:30 and 3:00pm. Each day we provide a richness and variety of activities and experiences in a flexible and pleasant atmosphere that introduces the children at Tower Day School to the exciting world of nature, art, science, math, social studies, language and music. We want each child to find school a happy place where he/she will derive satisfaction from inventing, creating, discovering, practicing skills, taking responsibility as well as meeting and solving problems in the presence of sensitive teaching. We consider the total child and provide experiences to encourage physical (gross and fine motor), social, emotional, and intellectual development. Our classes are divided by age group: 3 year olds, 4 year olds, transition for 4.5 to 5 year olds. The focus of our 2.9 and 3 year old classrooms is definitely social emotional development. Using the learning areas listed above, the teachers spend time helping the children play together, learn to share, use their words, begin to take responsibility for their personal objects, and become comfortable being away from home. In general, they are socialized to “life in a classroom”. Although social emotional development is a factor throughout early childhood, our four year old classes also have an eye on the educational skills necessary for literacy and other academic development. There are many language activities at Tower Day School. Children are exposed to new vocabulary, descriptive words, re-telling of events and other activities to increase their oral language skills. Our students use every math operation that adults use. They do simple addition and subtraction, make graphs, estimate, predict, form sets, etc. Needless to say, these are all completed in a very hands on manner. In order to maximize individual attention, our preschool class size is capped at 12 children per class with a teacher and a teacher assistant, or in most cases, two teachers. In October, the teachers will meet individually with each child’s parents for an adjustment conference. The purpose of this conference is to let the parents know how the child has settled in. It is also a good time for the parents to share any concerns or information that would be helpful to the classroom teacher. The Tower Day School Parents’ Forum is a wonderful addition to our school. Parents volunteer their time to fundraise and use the money they raise to provide enrichment activities for the students of Tower Day School. For people who are interested in applying to the school, we hope that you will call us in the Fall at 781-334-5576 or email to towerdayschool@gmail.com, to arrange for a tour of the school. Individual tours are generally held in the mornings and last about 20 minutes. In order to respect the safety of the children enrolled, visitors should not expect to tour the school unescorted. Application Forms will be available on this site after December 1 for enrollment the following September. Priority for enrollment is given to present and former Tower Day School families. Notification of acceptance will be sent in January. Please see our tuition schedule for rates. The first tuition payment is expected with your confirmation of acceptance. Tower Day School does not discriminate in providing services to children and their families on the basis of race, religion, cultural heritage, national origin, political beliefs, marital status, disability, or sexual orientation.